Scoliosis is a common medical condition in which a persons spinal axis has a three-dimensional deviation. 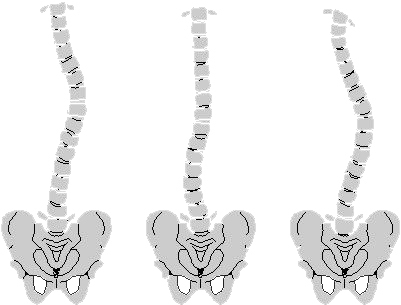 Although it is a complex three-dimensional condition, on an X-ray, viewed from the rear, the spine of an individual with scoliosis can resemble an “S” or a “C”, rather than a straight line. Scoliosis is typically classified as either congenital or idiopathic (cause unknown, sub-classified as infantile, juvenile, adolescent, or adult, according to when onset occurred), or secondary to a primary condition. Scoliosis is a chronic spinal condition, not particularly a disease. It’s a hot topic in the Pilates world, and in the hands of a skilled instructor, Pilates can excel in the long-term training needed to help change the many factors involved in the distorted spine and unbalanced musculature associated with scoliosis. In this article, I’ll introduce you to scoliosis and provide some guidelines and Pilate’s exercises for working with these clients. Pilate’s clients are often shocked to learn that scoliosis is not necessarily considered a diagnosis worthy of insurance reimbursement. It tends to be seen as a typical “individual difference” since everyone has some musculoskeletal asymmetry due to the asymmetry of the internal organs and the laterality from right or left-handedness. Plus some people can live quite asymptomatically although they show significant deformities. Scoliosis restricts the individual’s movement capabilities and can be utterly painful. While surgery is a popular option for people suffering from Scoliosis, it is also advised to look into other forms of corrective measures before going under the knife. Of the various options available today, yoga is one which has been around for probably the longest time and is also very effective. An ancient technique that not only helps at a physical level but also works at the mental level, rendering courage and patience to overpower the pain associated with Scoliosis. Historically the treatment options for Adolescent Idiopathic Scoliosis, the most common form of scoliosis are; exercises; braces and surgery. Methods and modules of rehabilitation are described in more detail within this review. Out-patient physiotherapy, In-patient rehabilitation and correct braces used in the rehabilitation of patients with scoliosis should be pattern specific as described to be current ‘Best Practice’. Evidence has been gained to support conservative scoliosis management. One short-term RCT exists to support out-patient PT, a prospective controlled study was found to support Scoliosis In-patient Rehabilitation. One prospective multi-centre study, a long-term prospective controlled study and a meta-analysis have been found to support bracing. No controlled study, neither short, mid nor long-term, was found to reveal any substantial evidence to support surgery as a treatment for this condition.